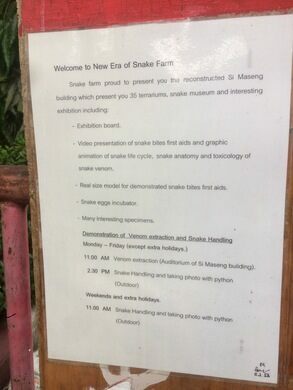 The Queen Saovabha Memorial Institute in the heart of Bangkok, Thailand, is a snake farm and museum operated by the Red Cross which specializes in the education, production, and research of anti-venom. The institute originally began as a facility to study rabies and smallpox vaccines, but has shifted its focus towards reptilian poisons. 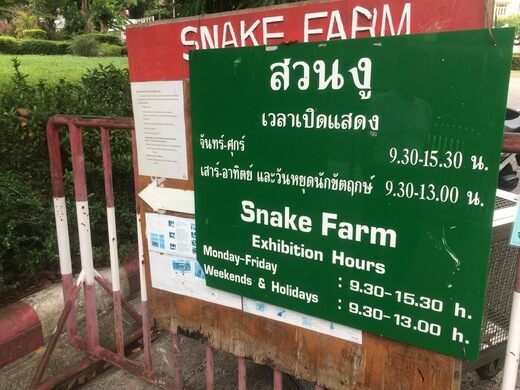 Within walking distance of Bangkok’s biggest shopping district, thirty-five species of venomous snakes are kept in both indoor and outdoor enclosures. The facility also houses several species of other dangerous reptiles, amphibians, and insects. The purpose here is not titillation but education. The Institute creates most of the region’s antivenin, which is used to treat snakebite victims, and in the process they seek to share their knowledge about these frightening, but fascinating, creatures. The museum contains two floors of snakes with accompanying information about their species and habitat. On the third floor there are preserved examples of snakeskin and skeletons. There is even a viewing area where, if you come at the right time, you can view the process of venom extraction. A museum in a law office, filled with authentic and counterfeit goods.